Only a few names can be included in the debate for the greatest left-hand pitchers of all-time and Warren Spahn's 21-season career certainly makes that case. His baseball card career is also impressive and his key cardboard appearances, along with a few lesser-known cards, form a top list aimed at a well-rounded collection. 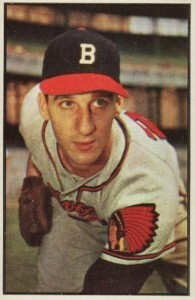 Shop for Professionally Graded Warren Spahn Cards on eBay. 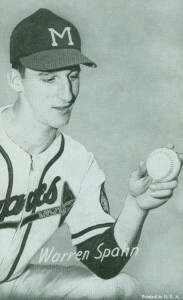 Spahn began his career with the Braves when they were still in Boston and his rookie year found him benched by the legendary Casey Stengel for refusing to throw at a batter. He would lose the next three years to his service in the Army during World War II but would return as the best pitcher in the game. 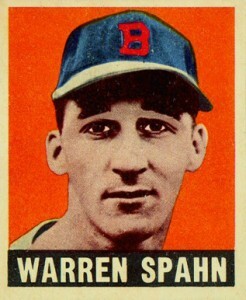 Totaling 363 wins, the most ever by a left-handed pitcher, Spahn won more than 20 games in a season 13 different times and was an All-Star an amazing 17 times. A marvel on the mound, he was also a great batter as far as pitchers go and still holds the career National League record for home runs by a pitcher at 35. With a career as legendary as his, Spahn has several cards that collectors may be interested in outside of the ten featured below. An early card that predates his 1948 Bowman and Leaf rookie cards is found in the 1947 Tip Top Bread set. He also shared several pitching leaders cards with his top National League peers, Sandy Koufax and Juan Marichal, in 1964 Topps. 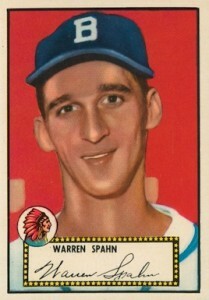 Warren Spahn only has one non-Braves card from his playing days and it is found in 1965 Topps. The card highlights his brief stint with the New York Mets. He was also a pitching coach with the Cleveland Indians in the 1970s and was featured on the Indians' managerial/coaches card from the 1973 Topps set. Collectors looking for a nice project can buy a box of 1989 Donruss and put together Spahn's Diamond King puzzle using pieces that were included three per pack. 2010 Topps National Chicle features a beautifully-painted Warren Spahn card with him shown in the middle of his famous wind-up. Because Spahn's rookie and other early baseball cards command huge prices at auction, there are some very expensive Warren Spahn cards to chase. However, this top list mixes card value along with design and accessibility to collectors in hopes of creating an eclectic group of his best cards. 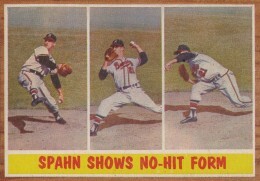 A rare example of action photography used in Topps' sets during the 1960s can be found on Spahn's 1962 Topps card. Three quickly-taken photographs demonstrate his pitching delivery that was notorious for being able to keep runners on first base. The card specifically honors the no-hitters thrown by Spahn in 1960 and 1961. Cards in the 1955 Topps Doubleheader set were designed to be folded in half and give collectors two cards in one. 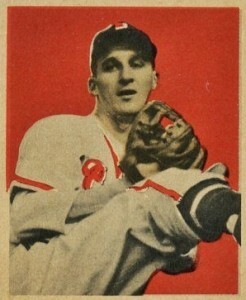 Spahn shares his card with Boston Red Sox pitcher Tom Brewer and when the card is folded, Spahn's legs become Brewer's legs. Going even further, when the cards are placed in numerical order, it creates a large complete image of the stadium partially seen in the card below below. 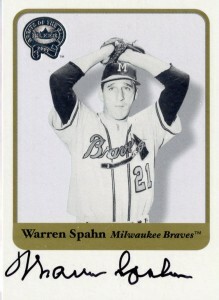 A great place to start your Warren Spahn collection would be with his Exhibits card. The Exhibits cards were sold through vending machines for nearly two decades and so there are often a lot of cards to choose from the most popular players. You can find a nice copy of Spahn demonstrating his fastball grip at a very budget-friendly price. Spahn's full-color photo debut in 1953 Bowman is one of the most valuable cards in the set and near-mint grades or better can reach prices of $200 and up. The reverse side of the card reminds us that Spahn dominated that National League in strikeouts and led the league in K's four times over his career. A handful of cards in the 1952 Bowman set have an arrow in the background pointing toward the "grandstand." Spahn is one of these options and the placement of the arrow appears to be pointing directly at him. It makes the card one of the more memorable images in the set and it can command prices of several hundred dollars at auction. 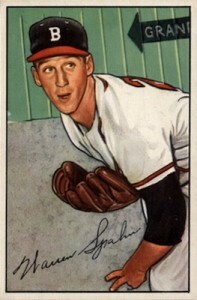 Although Warren Spahn has a card in the 1951 Topps Red Backs set, collectors tend to skip over that card and head straight for his 1952 Topps appearance. Perfect mint copies of his 1951 Topps card often go for much less than near-mint copies of his 1952 Topps. Spahn passed away in 2003 and so his certified autographs are limited to only a few sets from the early 2000s. The Fleer Greats of the Game sets were lucky enough to have Spahn sign in the 200o and 2001 sets and either one would be a great place to start for a Spahn autograph. 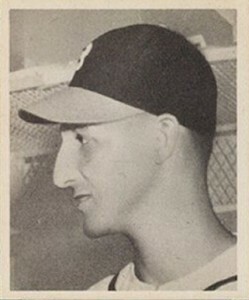 Warren Spahn was given the nickname of "The Hook," not so much because of his left-handed pitching delivery but because of his prominent nose which is featured on his 1948 Bowman rookie card. His card is one of the most valuable cards in the set, often reaching the prices of the other key rookies like Stan Musial and Yogi Berra. Spahn's card from 1949 Bowman shows you exactly how high he would kick up his leg during his wind-up and collectors can find a painted full-body variation of the same picture on his 1950 Bowman card. There are both gray and white back variations of this card. The 1948-1949 Leaf Warren Spahn rookie is one of his most striking cards and further highlighted by the vivid pumpkin-orange background. Part of the first color set following World War II, there are also color variations for Spahn that make the background look yellow and either version can command prices near $1,000 for near-mint graded copies.